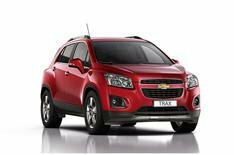 Chevrolet Trax prices announced | What Car? The Chevrolet Trax is a small SUV that's designed to compete with the Nissan Juke. Two trims are available: LS and LT. Entry-level LS cars cost from 15,495, while LT trim starts from 17,495. LT cars come with Chevrolet MyLink technology, which allows the driver to connect their smartphone to the car and share media and data such as photos and contacts. The engine range comprises two petrols a 138bhp 1.4-litre turbocharged unit and a 113bhp 1.6 along with a 128bhp 1.7-litre diesel. The 1.4 petrol gets a six-speed manual, while the 1.6 is mated to a five-speed manual. The diesel is available with either a six-speed manual or a six-speed automatic. All manual versions will come with engine stop-start as standard. Both front-wheel-drive and four-wheel-drive variants will be offered. The Chevrolet Trax can be ordered now, with deliveries from July.